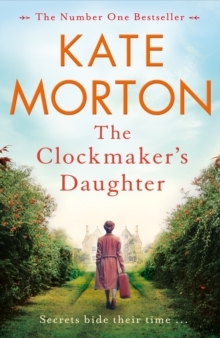 From the bestselling author of The House at Riverton and The Secret Keeper, Kate Morton brings us her trademark mix of secrets, lies, and intricately layered mysteries in her sixth novel, The Clockmaker's Daughter. My real name, no one remembers. The truth about that summer, no one else knows. In the depths of a nineteenth-century winter, a little girl is abandoned in the narrow streets of London. Adopted by a mysterious stranger, she becomes in turn a thief, a friend, a muse, and a lover. Then, in the summer of 1862, shortly after her eighteenth birthday, she retreats with a group of artists to a beautiful house on a quiet bend of the Upper Thames . . . Tensions simmer and one hot afternoon a gun-shot rings out. A woman is killed, another disappears, and the truth of what happened slips through the cracks of time. Over the next century and beyond, Birchwood Manor welcomes many newcomers but guards its secret closely - until another young woman is drawn to visit the house because of a family secret of her own . . . As the mystery of The Clockmaker's Daughter by Kate Morton begins to unravel, we discover the stories of those who have passed through Birchwood Manor since that fateful day in 1862. Intricately layered and richly atmospheric, it shows that, sometimes, the only way forward is through the past.